In the Philippines, Christmas season starts from September, but in Japan it is roughly one month from the end of November to December 25. However, Christmas in Japan is just commercial festival, for except Christian. Christian is only a few percent of the population in Japan. Illumination is decorated in various places independent of religion. Or Christmas is a day like the following. About 30 years ago, the Japanese economy was at its peak. And at Christmas Eve, all hotels and romantic restaurants were also full of reservations. That day was meant as “the day the lovers spends intimate moments”. However, due to the subsequent stagnation of the economy, such a trend has been totally hidden. Currently there are many people who do not notice because they are working as usual days. There is a Japanese named Mr.Donald Keen. 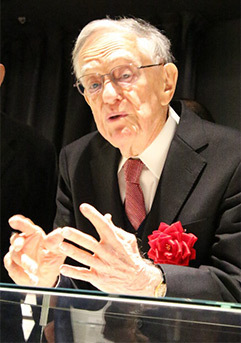 He is 95 years old and born in the United States. But he has been active as an interpreter and a literary person in Japan for a long time, since he was deeply proficient in Japanese literature and culture from he was young. So his current formal name is Keen Donald. The family name is ahead than first name. I like his this episode. “The athere day, I was asked for directions from a Japanese elderly couple in the city of Japan.” He is familiar with Japan more than most Japanese but his face is a foreigner. I understand if they knew that he was Mr. Keane. But, if they did not know, he was making an atmosphere as a Japanese. Plastic bags are “vinyl bukuro” in Japanese. I do not know what language “vinyl” is, or etymology of it. But many Japanese think that it is English since the sound is like a foreign word. Author michiakiPosted on 11/28/2017 Categories Japan & JapaneseLeave a comment on What is vinyl? In Japan, we do not have a habit of taking home what we could not eat at a restaurant. Except for restaurants that assume take-outs such as fast foods, We are supposed to eat all in the restaurant. I do not know why but I heard from olden days. Therefore, let’s order as much as you can eat on there. Soba is also traditional Japanese noodle dish. It is made from buckwheat flour. Soba has two main types of cooking methods. One is a hot type. It’s put Soba into hot soup, just like udon. Another one is a cold type. We soak soba noodles in cold soup and eat it. Soba is also a carbohydrate. However, because there are a lot of protein and dietary fiber which is considered a little healthy food than udon. As you know, Japan is safe. In many places it is safe to walk alone by a woman at night, and we often see the sight going to school or going out alone for children around 10 years old. Even if you sit down on a train seat and sleep, you are OK in most cases. Although the incidence of crime is relatively small, violent people, anti-social impulses and propensity are also in Japan. The other day, a young man arrested. He murdered 9 people in a short beriod. Japan is peaceful, but please be careful not to overrepair even if you come to Japan. There are many shops in Japan that sell all items at 100 yen (+ consumption tax). 100 yen is about 40 – 50 pesos. Those shops sell for 100 yen even it is a worth expensive item. Since they suppress purchasing costs by purchasing in bulk. 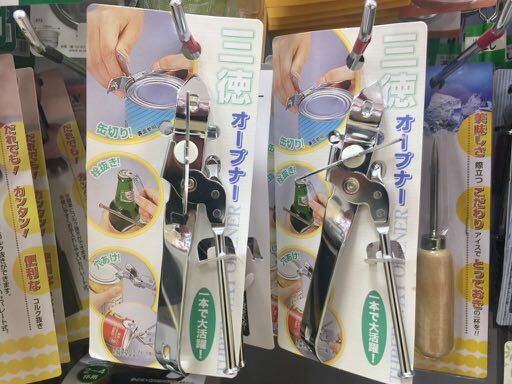 For example, this can opener is also 100 yen. It is cheaper than buying in the Philippines. Also, packages that are more expensive, such as detergents, are sold at 100 yen by reducing the amount. Therefore most of daily necessities can be purchased at 100 yen shop. There are inferior goods while it is cheap, but if you make good use of the 100 yen shop, you can suppress your daily expenses. In addition, the largest store called “Daiso” sells with products of 200 yen or more not only 100 yen item. Therefore the product range is more abundant than the 100 yen uniform shop. Microwave is called “Denshi Renji” in Japanese. “Denshi” is an electron in Japanese, and “Renji” is maybe a Range of English. A Japanese who can not speak English does not understand what “microwave” is. Of course they can not understand “heat up” or “warm up”. So when you buy something at the convinience store and you want warm it up, say “Atatamete kudasai” to the clerk. Or simply say “Chin”. “Chin” is the bell sound when the time up of the microwave. You can order by the short word. There used to be a US military base in Subic and Clark at Luzon. There are still many US military bases in Japan. Okinawa’s Kadena, Tokyo’s Yokota, Kanagawa’s Zama, Nagasaki’s Sasebo etc. This is a remnant of occupation after the Pacific War. But it is not necessarily humiliating. Because postwar Japan was able to concentrate on economic activities by outsourcing military power to the United States. By the other hand, The United States was able to continue the alliance relationship between the two countries while deterring Japanese reinforcement strengthening. However, US soldiers cause serious incidents in Japan occasionally. Especially in Okinawa Prefecture. Okinawa was occupied by the United States until 1972 even after the war. And there are still many US military bases there. In Okinawa, traffic accidents and women violence by US soldiers are repeated. Of course most of the US soldiers are harmless, but the incident that had not happened without a US military base gives a bad impression. Also, the overhead of Tokyo is under the control of Yokota Base, and the route that Japanese aircraft can fly is largely restricted. However, if Japan asks for the withdrawal of the US military, Japan will be required to take self defense. Therefore Japan need to promote the SDF to military, and heavily armed them. Of course it costs huge costs. In addition, the conscription system may be inevitable. And when the war broke out they will be dispatched to the battlefield, since they are soldiers. How to get along with US military bases is a painful issue. The Japanese Constitution was created by the United States which occupied Japan after the Pacific War. The big feature is abandonment of war. The United States that received great damage in the battle with the Japanese army wanted that Japan had no great military force after the war. Therefore Japan can not invade other countries with force. However, Japan has the Self Defense Force (SDF) to protect the country from attacking by another country. By the way, SDF of Japan is also required to cooperate for PKO in overseas conflict areas in recent years. However, their activities are restricted to digging wells for local residents, or supplementing supplies to allies, due to constraints of the Constitution. Therefore, the SDF is not killing any persons in the battlefield as anyone until today.